What did we miss? Share an article from your state in the comments section. Recently, the National Labor Relations Board (NLRB) issued a public notice that it may change its determination of how nursing home employees unionize. Prompted by a recent court case, the Board is considering allowing for multiple bargaining units based on job title, which means several units would represent the staff of one facility. Such a divisive change could result in a negative impact on the quality of integrated care necessary for the elderly, higher unit labor costs, and an overall increase in health care costs for our fastest growing and most vulnerable patient population. AHCA/NCAL submitted testimony on the issue earlier this month during a hearing by the House Education & Workforce Subcommittee on Health, Employment, Labor & Pensions. The testimony argues that the NLRB is, in effect, abusing its discretionary authority to change how workers in nursing and assisted living facilities unionize. The testimony also states that, cloaked as rulemaking, the NLRB is engaging in legislation through a recent proposed rule regarding posting employee rights under the National Labor Relations Act. This movement, previously under Congressional oversight, is unprecedented and alarming. Read more in AHCA/NCAL’s testimony online. I just returned from our annual Quality Symposium in San Antonio, Texas. Once again the symposium demonstrated the tireless commitment that our membership has to providing outstanding care for the greatest generation. Of particular note was the Friday morning CEO panel moderated by Neil Pruitt, Vice Chair of the AHCA Board of Governors and President and CEO of UHS-Pruitt Corporation. The panel featured insights from Gail Clarkson of MediLodge, Dr. Neil Kurtz of Golden Living, and Tony Oglesby from SavaSeniorCare. Each runs their respective companies, and each has had stunning success in improving quality. I was not surprised that all of them instituted the type of goal setting and strategic planning that we are undertaking here at AHCA/NCAL. Their focus is resident, family and employee satisfaction. Each measures everything, provides incentives for reaching goals, and focuses on areas for improvement. At MediLodge, quality improvements have led to customer and staff satisfaction rates of 95% and 85%, respectively, with the average tenure of administrators lasting beyond 10 years. At Golden Living, improved quality measures and performances at the staff level doubled the number of deficiency-free surveys in facilities from 17 to 30 in just one year. At SavaSeniorCare, the organization focused on workforce stability, among other assets, and produced impressive results. Staff turnover has been reduced by almost 30% and customer satisfaction has increased by 11%. These results reflect the quality phenomenon that’s happening in our profession today. Our 2010 Annual Quality Report indicates that in areas that really matter, like the use of restraints, reports of residents in pain, and the presence of pressure ulcers, nursing homes and assisted living facilities across the country are making remarkable progress profession-wide. Today, 39 percent of Medicare patients return home within 100 days of admission, a percentage that has increased annually since 2003. As significant as these measurable improvements are, it is important to remember that some areas of quality cannot be measured. During the symposium, I was able to tell attendees about the many acts of quality that I personally observed during my 10 year experience with residents. Sometimes quality is a gentle touch on the shoulder of a lonely resident, a warm smile, or even a big hug. Other times it’s taking a moment to listen to a resident share her life experience through a story. Quality means allowing residents to continue their own hobbies and pastimes, well into their old age. Whether it’s watching basketball, going out to eat, or reading a book, quality recognizes and accommodates residents’ needs, wants and desires. Quality is a CNA who knows that every resident doesn’t want to wake up at the same time. She wakes residents when they want, not when it’s convenient for her schedule. Quality is a chef who knows just how the resident likes his breakfast and has it ready and warm for him every day. And perhaps most importantly, quality is not focusing on what our residents cannot do, but celebrating what they can. Whether it’s taking another step during rehabilitation therapy or using artistic talent to create a work of art for the facility, it all happens in a quality environment with quality people. This makes our work in Washington even more important. While we’ll continue the battles for Medicare, Medicaid, and other resources, we’ll never forget what we’re really fighting for - quality. The Quality Symposium was a great reminder of what it’s really all about. 5) OVERNIGHT HEALTH: Where does 1099 go from here? What happened in your state over the week? Share an article or two with us in the comments section. This past week saw a milestone for quality improvement. Advancing Excellence in America’s Nursing Homes, a national campaign to help nursing homes achieve excellence in quality of care and quality of life, surpassed the 7,000 mark for participation into the campaign. This means that 7,015 of the nation’s 15,000 nursing homes, or about 44 percent, are actively taking steps and receiving support to make their facilities great places to live, work, and visit. Nursing homes participating in the Campaign benefit from number of free, evidence-based tools that are tailored to specific goals of the campaign. Staff turnover, pressure ulcers, and resident satisfaction are just a few. The Campaign operates through a structure of Local Area Networks for Excellence (LANEs) to provide direct support in individual communities. One of the most interesting features about Advancing Excellence is that you don’t have to be a nursing home to join. Staff, residents and even families can participate too. Check out the reasons why on their registration page, and if you’re on Facebook, be sure to look them up. Tomorrow kicks off the 3rd Annual Quality Symposium in San Antonio, Texas. Jam-packed full of education sessions and networking opportunities, it’s sure to be a hit for long term care professionals. Leadership – which groups together the categories of leadership, strategic planning, and customer and market focus. Information Systems – which highlights measurement, analysis and knowledge management. You can read the full program including session descriptions on our website. Attendees will hear from real-life Baldrige award recipients during the keynote addresses. 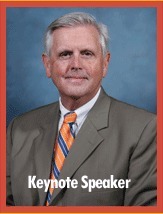 Terry Holiday, PhD and Commissioner of the Kentucky Department of Education, will speak on Thursday, February 17th. In addition to a number of quality achievements, Dr. Holliday led the Iredell-Statesville school district to receive the 2008 Malcolm Baldrige National Quality Award. His earlier work as a school administrator led to the closing of achievement gaps and marked improvement in graduation rates and other student achievement measures. AHCA/NCAL is giving away a copy of Dr. Holliday’s book - Running All the Red Lights: A Journey of System-Wide Educational Reform – to every attendee. On Friday, February 18th, Priscilla Nuwash will speak about quality in the health sector. During her tenure as Director of Quality Improvement, Poudre Valley Health System received the 2008 Baldrige National Quality Award for Health Care. She currently serves as an Alumni Examiner on the Baldrige National Board and judge for the Colorado State quality program. We’ll have more highlights from the Quality Symposium later this week. Yesterday, President Obama released his budget proposal for Fiscal Year (FY) 2012, which seeks to reduce the national deficit by $1.1 trillion over ten years. Of interest to long term care providers is the inclusion of a phased reduction to the Medicaid provider tax, which is a tax paid by health care providers to help fund state Medicaid programs (provider tax is also referred to as provider assessment, bed tax, or quality assessment fee). Beginning FY 2015, the allowable percentage – or the amount that state governments can actually tax – will be reduced to 4.5 percent. In the end, this means fewer dollars funding state Medicaid programs. The budget also outlined phased reductions in the future – 4 percent in FY 2016 and 3.5 percent in FY 2017. While the budget proposal appears bleak for providers, it’s important to remember that it only serves as a recommendation to Congress. In the future, the House and Senate Budget Committees will take it under advisement; they are not required to incorporate any of the President’s recommendations into their own budget bills, and often do not. AHCA/NCAL will continue to monitor the FY2015 budget as it develops and keep updates posted here on our blog. For more information on the President’s budget, read AHCA/NCAL’s detailed budget summary. Next week, AHCA/NCAL will host the 3rd Annual Quality Symposium for long term and post-acute care providers in San Antonio, Texas. This annual event is designed to be highly interactive with idea sharing and plenty of networking opportunities. The program features over 20 individual sessions, provider poster sessions, and keynote speeches all focused on the goal of performance excellence. • Advanced Sessions - for professionals who have achieved performance excellence and are looking for ways to sustain their gains. As a real life example of excellence, the symposium will highlight the 2010 recipient of the Gold - Excellence in Quality Award, Manchester Manor. Located in Manchester, Connecticut, this facility is a 126 bed skilled nursing center that provides rehabilitation services and complex sub-acute care. Get a sneak peek of their story by watching this video. Are you on a quality journey? Stay tuned for more highlights on next week’s symposium. During the State of the Union Address, President Obama expressed support for medical liability reform, which was suggested by Republicans last year to rein in frivolous lawsuits. In light of the President’s announcement, AHCA/NCAL recently declared its support for the initiative. Currently this measure enjoys broad bipartisan support, and could serve as the beginning of consensus-building momentum on other health care priorities for the 112th Congress. As lawmakers consider what’s doable this congressional session, tort reform has a real possibility of becoming law. In the long term care world, this means preserving dwindling resources for patient care and adequate staffing. Even though questionable lawsuits are often settled out of court, the sheer volume of them drains financial resources, according to a recent actuarial analysis by Aon Global Risk Consulting. Internal analyses show that siphoning off needed resources in this way can inhibit care quality, may lead to a deteriorating living environment, and problematic staffing ratios. A recommendation by the National Commission on Fiscal Responsibility and Reform for an “…aggressive set of reforms to the tort system” in its final report titled “Moment of Truth,” released in December 2010. AHCA/NCAL will continue to follow the tort reform debate as it develops. If you have questions, please share them below. Yesterday, The New York Times published a letter to the editor from Governor Mark Parkinson, President and CEO of AHCA/NCAL and Alan Rosenbloom, President of the Alliance for Quality Nursing Home Care, regarding the delicate and often unknown relationship between Medicare and Medicaid funding. The letter was in response to an earlier Times article, “For Governors of Both Parties, Medicaid Looks Ripe to Slash” (front page, Jan. 29), which highlights the predicament confronting several state governors as they attempt to detail budgetary priorities in the midst of state fiscal challenges. As reported in the article, the problem is only becoming larger as several states are unable to lower Medicaid eligibility due to federal prohibitions. As Parkinson and Rosenbloom state, Medicaid is increasingly reliant upon Medicare to supplement the gap between the growing costs of providing care and the amount state Medicaid programs actually pay to reimburse facilities. Cutting one or both of these programs would only widen this gap and threaten access to care for the millions of individuals that receive care every day. Add to this the fact that Medicaid underfunded nursing facility care by $5.6 billion in 2010, and the risk of cuts seems even more devastating. Take New York, for example. A recent study -- A Report on Shortfalls in Medicaid Funding For Nursing Home Care -- found that New York ranked #1 for both the largest aggregate Medicaid underfunding and largest Medicaid per patient day underfunding in 2010. According to the Times’ article, New York faces proposals for even more cuts this year – totaling about $2 billion in state spending. You can read more in the entire letter online. Is your state’s Medicaid program at risk for cuts? Share your stories with us below. Today, HHS Secretary Kathleen Sebelius sent a letter to governors outlining the flexibility and support available to states that are examining how to make Medicaid programs more efficient while meeting pressing health care challenges in the face of difficult budget circumstances. She notes in particular that dual eligibles -- those eligible for both Medicaid and Medicare -- are an expensive population where costs can be lowered. AHCA/NCAL continues to be concerned about the focus on dual eligibles as a way to contain costs. While we support integrated, coordinated care, we do not believe that a merging of the Medicare and Medicaid program at the state level would be an effective and safe means of caring for this vulnerable population unless many safeguards are included and standards of accountability are strengthened. For more information, read the full letter available on the HHS website. AHCA/NCAL recently released an analysis of the economic impact of nursing facilities on national, state and local economies. 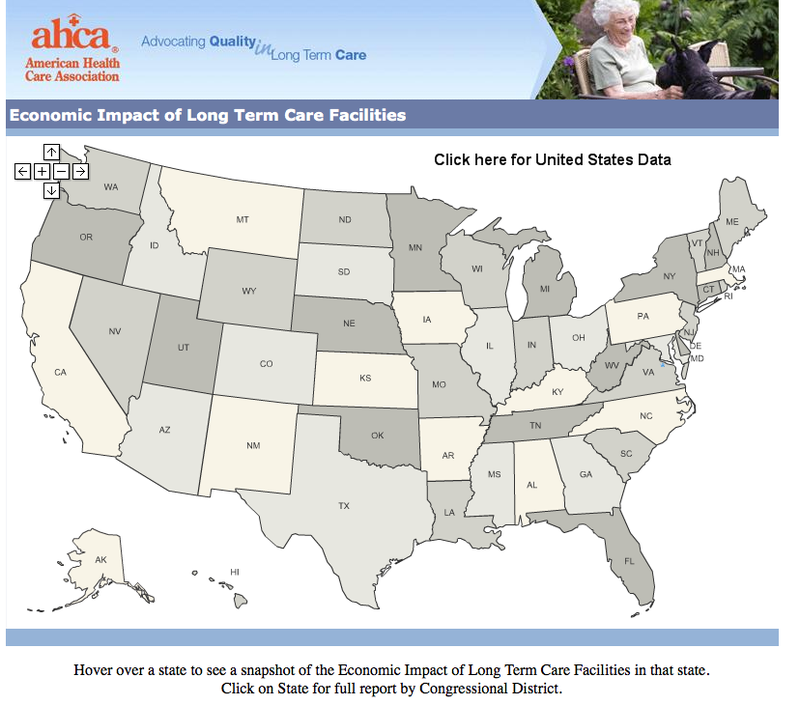 Available in a state-by-state, one-pager format, the data findings underscore the important role that nursing facilities play in the economy, and is helpful in urging lawmakers to protect the funding streams for long term care. Echoing the national figure, there are 20 states where long term care is in the top ten of largest employers. There are 10 states in which long term care employs more than 10,000 individuals. Long term care is a top ten employer base in 172 congressional districts. There are 50 congressional districts where long term care employs more than 10,000 individuals. 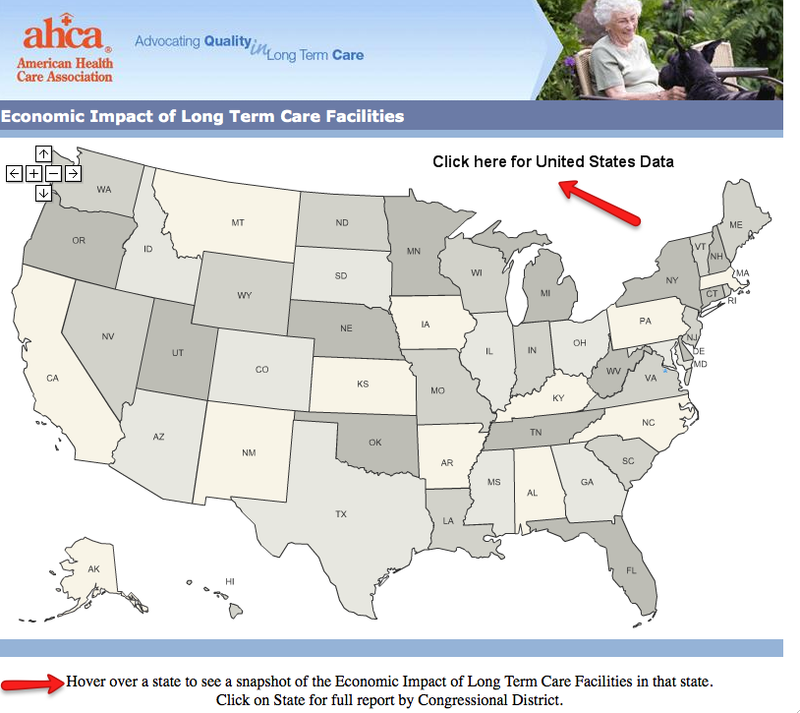 In 25 of 29 congressional districts in New York, long term care is in the top ten employers. You can access state-specific information via an interactive map on the AHCA/NCAL website. With business lines stretching well beyond health care into transportation, food service, real estate and other sectors that keep the economy strong, long term care facilities rank ahead of industries such as merchandise retail (2.9 million), food retail (2.9 million) and both military (2.3 million) and non military federal government personnel (2.1 million) in terms of largest overall employment. The analysis was based on data and compiled by AHCA using Impact Analysis for Planning (IMPLAN) data software, which allows for in-depth examinations of state, multi-county, county, sub-county, and metropolitan regional economies. Do you plan on using this data in your state? Recently AHCA/NCAL wrapped up its week-long series, The State of Long Term and Post-Acute Care. The series was created to generate awareness and buzz around current issues in long term and post-acute care. Beginning on January 18th AHCA/NCAL released daily press releases, fact sheets, and blog posts featuring highlights in quality, workforce, post-acute care, assisted living, economic indicators and reimbursement. · The Centers for Medicare and Medicaid Services (CMS) confirms that nursing homes made measurable quality improvements in 16 of 26 quality indicators between 2000 and 2009, with positive trends continuing in 2010. · Recent data indicates that over 50 percent of Medicare beneficiaries in need of post-acute care following a hospital stay are discharged to a skilled nursing facility, making nursing homes the largest single provider of post-acute care in America. · Nursing homes are treating and discharging patients at a higher rate today than ever before with 39 percent of Medicare patients returning home within 100 days of admission. · By 2050, 6.6 million caregivers will be needed to care for the 27 million Americans who are projected to need long term care and services. · With nearly 40,000 residences across the nation, assisted living communities are a viable and welcome option for many older Americans. · On average, assisted living residents need help with two activities of daily living, and assisted living communities across the country strongly embrace the concept of person-centered care. · Medicare is often at risk for significant cuts, threatening the delivery of high quality care and services. · A typical Medicare beneficiary returns home or to the community after a relatively short, rehabilitative stay of 36 1/2 days in a skilled nursing facility. · Medicaid – the largest payer of long term care & services – covers 64 percent of nursing home patients and 13 percent of assisted living residents. A recent report from Eljay found Medicaid across America to be underfunded by $5.6 billion in 2010. Read more in a guest commentary in Long Term Care Living from AHCA’s Greg Crist, Vice President of Public Affairs.